This was a challenging project as they’d developed and expanded their old site to almost breaking point and usability and navigation had become muddled and confusing for visitors with overly long on-page text and content repetition. I began by reviewing their entire websites’ page content and streamlining their offerings in clear, simple to understand categories and then reviewing the text content to help them write better more succinct web copy once the ‘wireframes’ haas been presented. Once the initial ‘review’ process was complete it was time to start planning the website structure and page layout. The final ‘wireframes’ were developed over the course of 4-6 weeks with constant tweaking to the user experience based on testing and client feedback. These were presented and were greeted with excitement over the possibilities the new layout was going to give them to promote their ‘products’ and the extent of content management (CMS) they were going to be able to have over the page content. The design was skinned over my wireframes by Martin Hailes of Martin Hailes Design who undertakes High Lodge’s excellent print based work and it was a good collaboration between the two of us to get the best ‘brand experience’ when you visit the website, ensuring consistency with the offline print work. The web build was hand-coded from a basic framework into a bespoke WordPress theme that offered the client CMS control of pretty much every aspect of their websites’ content. I built it to be responsive meaning that it would reflow and reorder the pages content to give the best viewing experience whether it’s viewed on a smartphone, tablet or desktop PC. WordPress was my choice of CMS framework as it offers a great level of flexibility in both it’s frontend and backend control and has proven to be one of the most popular open source CMS platforms among customers. As with all my website projects I also advised on their on-page SEO metadata including keywords, page titles and descriptions which helped when it came to content populating the website and the installation of Google Analytics for tracking purposes. After some on-site training with the client and a helpful set of CMS guidelines the final website was made live earlier this year and has proven to be very popular with not only the client but also the customers themselves who comments included “modern, clean lines and fresh”. Since then I’ve been on-hand to help with any content queries or to advise on future updates and functionality. Every website is unique and each client has a different set of ‘goals’ or ‘targets’ they want to achieve with their website but the way I approach any web project is the same – planning, structure and content are key, because it doesn’t matter how fantastic the end visual design may be, if the user journey is poor and they can’t find what they want quickly and simply then you’ve failed. 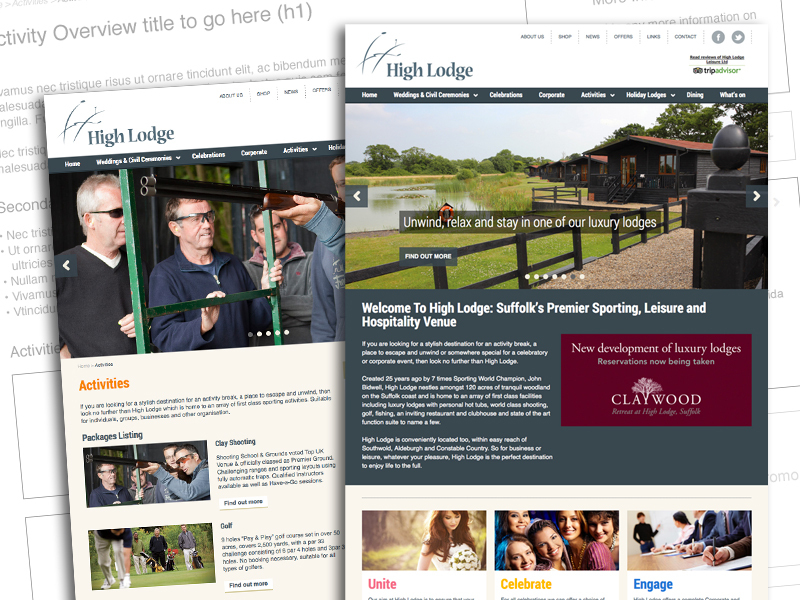 I offer a range of website design services from bespoke web builds like High Lodge Leisure, Suffolk to build that use quality purchased themes as their framework. This route means that there’s options available for all budgets whether you’re a sole-trader, small business or even a medium to large business. If you would like to know more about website design then please get in touch.